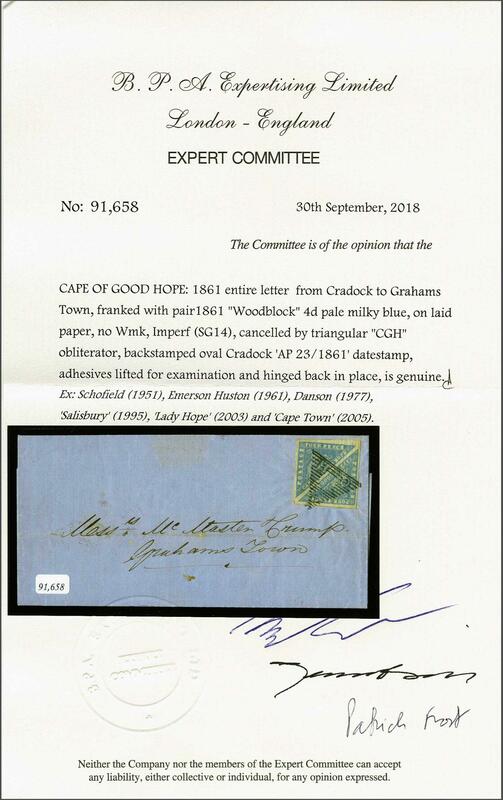 Provisional Issue 1861 (Feb 23): Woodblock 4 d. pale milky blue on laid paper, a square pair with large to enormous margins all round and of excellent colour, tied to 1861 entire letter from Cradock to Grahamstown by crisp strike of triangular CGH obliterator in black. Reverse with oval framed CRADOCK despatch datestamp (April 23) in red. The letter bemoans the falling price of the Wool market. The stamps have been lifted for checking and examination and hinged back into place. A truly fantastic entire of great beauty and surely one of the finest of all recorded Woodblock covers. A gem for connoisseur. Cert. BPA (2018).rnrnProvenance: Collection J. W. K. Schofield (1951).rn Collection C. Emerson Huston, Harmers, June 1961, lot 347.rn Collection J. R. Danson, RL, 1977, lot 1131.rn Collection 'Salisbury', RL, Sept 1995, lot 1054.rn Collection 'Lady Hope', DF, Nov 2003, lot 20310.rn Collection 'Cape Town', RL, July 2005, lot 33.